If you asked anyone what a major city would look like in 3020, you would probably get a pretty accurate description of Singapore. This small but mighty – and wealthy! – country has some of the most impressive buildings and futuristic architecture in the world, all surrounded by crystal clear water and luscious tropical vegetation that will make you feel like you stepped right into an Avatar film. If you want a taste of the finer things in life head to Marina Bay and marvel at the Marina Bay Sands, home to the most Instagrammed infinity pool in the world, and the spectacular Gardens by the Bay, a triumph of green and steel that will take your breath away. Orchard Road is another great choice if you’re interested in the futuristic side of the city. Here you can find hundreds of stores and other stunning viewpoints to appreciate Singapore’s skyline. Singapore is one of the most diverse cities in the world and it shows. Wander through Chinatown, Arab Street or Little India to feel like you’re country-hopping just by walking around and taste all the incredible Asian food this city has to offer. Hawker centres are the best places to fill your stomach without completely emptying your wallet and show you a more traditional side of Singapore, offering a delicious variety of South East Asian street food. If you’re more of a hipster at heart, don’t skip the local neighbourhoods of Haji Lane and Tiong Bahru, filled with colourful buildings, street art, and kopi-tiam, aka traditional coffee shops, to make your aesthetic hungry eyes happy. Singapore is known as a pretty expensive city, so staying in a hostel is a great way to keep it cheap. Luckily, this city boasts some pretty impressive places all within backpacker’s budget. You can also get private rooms for very affordable prices or have the same privacy in the characteristic cube hostels. Most hostels in Singapore are either in Chinatown or Tiong Bahru, and offer free breakfast and walking tours, a great way to save money in this rather pricy city. If you’re ready to experience the future and find yourself breathless in front of the melting pot of South East Asia, Singapore is for you. We’re here to help you find the best place to stay whether you’re a solo traveller ready to meet new friends, a digital nomad trying to make it in the Asian concrete jungle or a wild one ready to have the Lion City hear you roar. Take a look at the best hostels in Singapore and get ready to have your mind blown! In our humble opinion, nothing beats a colourful common room, a free breakfast, a rooftop terrace with a gazebo for Singapore’s rainy season and friendly staff that make you want to apply for a Visa just so you never have to leave them. Rucksack Inn is all of this and more, because it’s also just ten minutes away from the neighbourhood of Little India plus a local $1 swimming pool, a godsend in Singapore’s hot and humid weather. Imagine your own little flatshare full of friends, unlimited tea and coffee, plus 24-hour breakfast with peanut butter and Nutella. This is the Happy Snail Hostel, with a perfectly fitting name as you can take it slow and, well, be happy! If you need tips about food, don’t hesitate to ask the owner Mike, a self-proclaimed foodie and your new best friend. Meeting backpackers and building friendships for life is one of the best things about travelling, but after a long day spent in the humid weather of Singapore, a comfy bed and a bit of solo time is sometimes your preferred option. Dream Lodge gives you both: you can relax and meet new people over the free breakfast and then retire in your own private pod to catch some Z’s. What a dream! The Golden Hostel is a breath of fresh air in Singapore, literally, as it is surrounded by greenery. The owners, Allan and his mother, will welcome you with travel stories and tips about this crazy city, before offering you a yummy free breakfast. If you really want to experience Singapore like a local, the Golden Hostel is your best bet. If you want to live the boujee life in Singapore, look no further than the Pod – Boutique Capsule Hostel. This clean and minimalistic hostel is an interior designer’s dream, featuring marble kitchen counters, wooden pods and luxurious 300 cotton thread sateen sheets. C’mon, treat yourself. You deserve it. Did we mention there’s a free breakfast, which includes chicken nuggets! Winner winner, chicken dinner nugs for brekky! The earthy wood tones of this hostel and its modern and minimalist décor will make you fall in love. BEAT. Capsules is another capsule hostel in Singapore, except it isn’t… With super friendly staff, an amazing location close to several attractions and stations, a terrace with a stunning view of the Singapore River and queen-sized pods, THIS is the hostel you’ve been looking for. Singapore offers a crazy nightlife, with some of the best bars and clubs in the world. The fancy ones are in the Boat Quay area, right on the river, whereas, if you want to experience something more local, head towards Little India. These are the best hostels to stay at if you’re ready for a BNO (big night out) and want to save that taxi money for another drink. Did you know that cocktails in Singapore could set you back for £30 per drink? Yikes. That’s why we’re grateful places like the Inncrowd Backpackers Hostel 2 exist. Proudly claiming to serve the cheapest cold beer in Singapore and doubling up with very good vibes, there’s not much more you may need for a fun night in the city. Also, don’t miss out on the free scooter city tour, it’s a must! Have you ever slept in a spaceship? If the answer is yes, we are intrigued! But if it’s a no, then stay in the closest thing to one at the MET A Space Pod hostel. This hostel offers private pods complete with neon lighting and portholes so that you’ll feel like Neil Armstrong or Buzz Lightyear could be your neighbour! MET A Space is also right on top of a massive strip of restaurants and bars, in case you want to get wild under the stars before returning to your intergalactic space bed. Cube Hostel combines the posh feeling of a hotel, the fun community part of a hostel and the unique experience of staying in a capsule hostel. It is also located in the heart of buzzing Chinatown and has a chic bar downstairs where you can wind down with a fancy drink before retiring to your fancy pod. Oh, what a life! Quarters Capsule Hostel is the best place to experience the many sides of Singapore, from the cultural to the party to the laid-back vibes. With the privacy of a capsule hostel and the fun of a pink common room, Quarters Capsule Hostel has everything you need. River City Inn aim to provide a space to nurture ideas, inspiration, personal reflections and growth. It does just that, whilst also offering an amazing location within walking distance to Chinatown and Marina Bay. Talk about best of both worlds, uh? The good news… if you decide to stay at the Adler Hostel you’ll be able to walk to Singapore’s main attractions and Chinatown in a matter of minutes. The bad news… you probably won’t ever want to leave! At Adler’s you’ll be staying at one of the top ‘poshtels’ in Asia, where you can start your day with a free cup of coffee from the in-house café every morning. 5 minutes from Chinatown you’ll find Beary Best hostel, located in a beautifully restored art deco building that will welcome you at any hour of the day or night, thanks to its 24-hour reception. With its pastel windows you will definitely not miss it, nor will the friends you spam on Instagram with its colorful interior and giant collection of teddy bears! The Bohemian and The Chic are actually two sister hostels located a few steps away from each other. Both are in Chinatown and both are pretty awesome, boasting colorful interiors and the sweetest staff that will welcome you in the morning with free breakfast and coffee. Betel Box Backpacker Hostel is a simple (but very effective) concept: Good people, good food and a cute cat named Whiskey! It’s in a prime location to sample the super Singapore local nightlife or to crash for a night before catching a flight. Do you think you’re the next Elon Musk? Are you all about the hustle? Tribe Theory is the place for you. The owner Vikram believes in the power of the next generation and he’s ready to offer everything you may need to bring your next big idea to life, including a ton of networking occasions. Ready to take over the world? Tiong Bahru is one of the hipster neighbourhoods of Singapore, filled with cute cafés, colorful walls, and chic bars, and it’s right at the door of Coo Boutique. This boutique hostel matches its surroundings with trendy décor by Ministry of Design and an in-house restaurant serving super Instagrammable dishes. If you didn’t ‘gram it, did it really happen? We hope this guide helps you to discover the perfect hostels for your trip to Singapore. 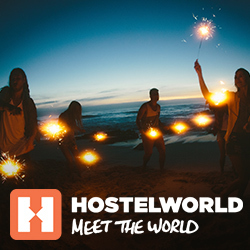 Let us know in the comments if you’ve stayed in one of our recommended hostels, or if you’d like to share a hostel that you think other backpackers shouldn’t miss. Now that you know about the best hostels in Singapore, it’s time to plan the rest of your trip!